Acronis turned in an impressive performance in the test, but also performed so well while consuming 1/2 the resources of the competition. When you think of hundreds of physical servers, that difference means big CAPEX savings. 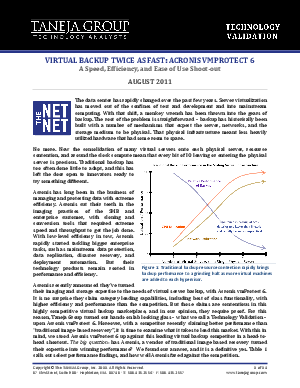 Read this Taneja Group report, Virtual Backup Twice as Fast: Acronis vmProtect 6, now!